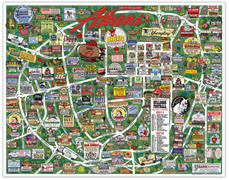 * This reflects where 15,000 Full colorCartoon Maps Posters are distributed in Athens, GA on February 8, 2011. These are "exact numbers," distributed in boxes of 100. This also reflects where future posters will be distributed. Please Thank Advertising Sponsors for making these FREE CARTOON MAP POSTERS available for pick-up and use. 15,000 Posters @ 102 LOCATIONS in Athens, GA Area - Distributed by Feb. 8, 2011 - Exact numbers.